Swanson Homeopathy Menopause Formula is a menopause supplement dedicated to offering women temporary relief from symptoms of menopause such as sleeplessness, hot flashes, and mood swings. Formulated by a doctor, this recipe is also much appreciated by consumers and there is positive feedback from buyers associated with this product. If you want to learn more about its ingredients and other benefits, you only need to read further our review. 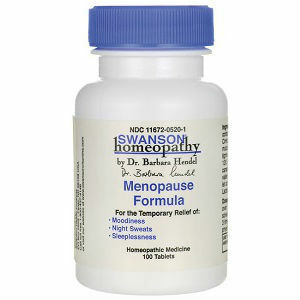 What Does Swanson Homeopathy Menopause Formula Contain? These are all the active ingredients you will find in each 300 mg tablet. Swanson Homeopathy Menopause Formula is said to be the result of 20 years of homeopathic research conducted by dr. Barbara Hendel. While it does not seem to contain any of the traditionally used remedies for relieving the symptoms of menopause, this can be a reliable product, since it was created by a doctor with extensive experience in making homeopathic treatments. The recommended dosage is two or three tablets daily that must be kept under the tongue to slowly release the active ingredients. Overdosing can be dangerous for your health, so if you take more than the recommended dosage, consult a doctor right away. A bottle with 100 tablets costs 9.99USD, and it can lasts almost two months, which is quite a great price. The manufacturer promises to refund the purchase costs to customers who are unhappy with the product. Swanson Homeopathy Menopause Formula sounds like a good ally for relieving symptoms of menopause, and it is sold for a cheap price, which is an advantage. Created by a doctor, it is also the result of intensive research in homeopathic remedies. Nonetheless, since we did not see any well known ingredients in this formula, it may not work for everyone. Jackie Horowitz	reviewed Swanson Homeopathy	on August 15th	 and gave it a rating of 2.5.